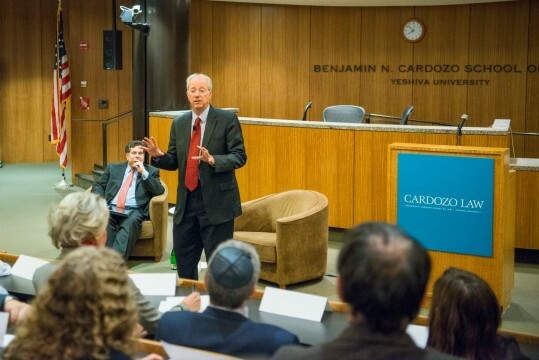 On April 19, Yeshiva University hosted American diplomat and author Dennis Ross, who delivered a lecture as part of the Dr. Marcia Robbins-Wilf Scholar-in-Residence Program at the Benjamin N. Cardozo School of Law. 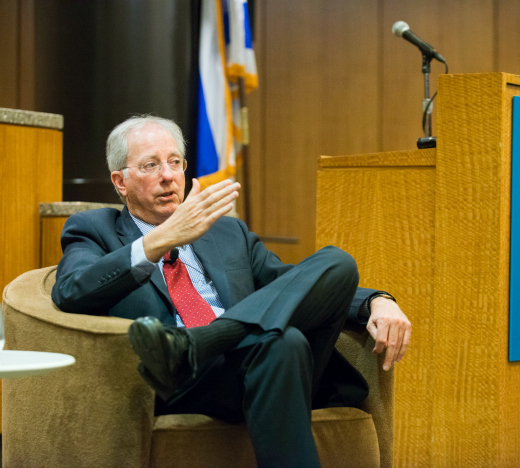 Ross, who served as the director of policy planning in the State Department under President George H. W. Bush, as President Bill Clinton’s Middle East peace envoy, and as special assistant to President Barack Obama, spoke about his recent book, Doomed to Succeed: The U.S.-Israel Relationship from Truman to Obama (Farrar, Straus and Giroux 2015), winner of the National Jewish Book Award’s Gerrard and Ella Berman Memorial Award in History. In his lecture, Ross provided an overview of the tensions existing in the U.S.-Israel relationship from 1948 to the present: from President Dwight Eisenhower’s erroneous belief that President Harry Truman had only recognized Israel’s independence for political reasons, to President Ronald Reagan’s suspension of F-16s to Israel in the wake of the Israeli bombing of the Iraqi nuclear reactor and siege of Beirut in the early 1980s and the Obama administration’s open disputes with Israeli Prime Minister Benjamin Netanyahu. Only during the Clinton era, said Ross, did the presidential administration view Israel as more of a “partner” than a “problem that had to be dealt with”—due, in part, to Clinton’s admiration for soldier-statesman Prime Minister Yitzchak Rabin. Although Ross acknowledged that movement toward a two-state solution to the Israeli-Palestinian conflict is at a low point, he stated that there is no alternative. “You have two national movements competing for the same space,” he said. A one-state solution, he argued, would be “a prescription for enduring conflict” and “perpetual war,” as seen in other regions with competing national identities.